On June 4th, Li Na became China’s first grand slam tennis champion as she defeated defending champion Francesca Schiavone in two sets to win the French Open tennis tournament. People are wondering what has led Li Na to the success. Besides her exceptional talent, there are four key elements that have created such a legend. Li Na was growing all the way up under the state sports system till she became a national champion and allowed to “fly alone” in 2008. She started to play tennis at the age of 8 around 1989. She was then selected to join the provincial tennis team at age 12, joined China’s National Tennis Team in 1997 and turned pro in 1999. Although Li’s post-fly-alone French triumph shakes up the old state system now, even Li herself admitted in interviews the vital role of the state system in her early stage. It was the state system that provided her with the financial and professional support she needed to develop when there was little tennis infrastructure or culture in China and when almost no Chinese families could afford to develop their kids into pro tennis players. 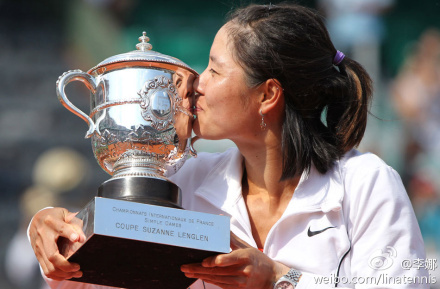 At a post-match press conference soon after her win at the French Open, Li Na said “I really want to thank Director Sun. Without the (“fly-alone”) reform initiated by her, I wouldn’t have accomplished today’s success. She has played a very vital role in the sport of tennis in China.” (Via WSJ) The Director Sun mentioned by Li Na is Sun Jinfang, the director of the Tennis Sport Management Center with the General Administration of Sport of China. Li was allowed to opt out of the national team as well as the state-run sports system in 2008 under an experimental reform policy for tennis players. This change was called “Fly Alone” by Chinese media. As a result Li had the freedom to pick her own coaching staff and she could keep more of her winnings. Only 8 to 12 percent of her winnings go to the government as opposed to 65 percent previously. Also allowed “fly alone” at the time include three other top Chinese women tennis players Zheng Jie, Yan Zi and Peng Shuai. 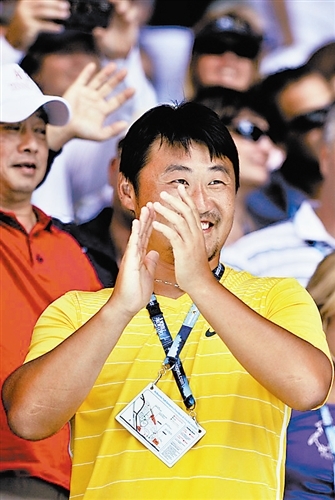 Li Na’s husband coach Jiang Shan can probably be named as the No.1 person behind Li Na’s success. Right after the French triumph, Li Na said in front of the press “fat or skinny, handsome or ugly”, she’d always love him (Jiang). Although Jiang keeps low profile now and always shows his smile when his wife Li makes joke of him during interviews, Jiang used to be among the best male tennis players in China, winning a national mixed doubles gold medal and a national group gold medal among others. Jiang first became Li Na’s coach in 2004 when Li returned to the national team, and then the second time when Li Na’s former coach Thomas left Li last year. Jiang guided the world No.7 Li to the final of the Australian Open in this January. Although Li replaced Jiang with Danish coach Michael Mortensen after losing the final to Kim Clijsters followed by her next four matches, Jiang is still her hitting partner and more like a 360 degree assistant, helping Li set up training plan, get weather forecast, watch competitors’ game on site and collect competitors’ information, etc. It is undeniable that Thomas and Mortensen have both contributed to Li’s growth significantly, but Jiang has always been the one Li trusts the most and the one that could fully understand Li and give her best support and encouragement when she needs. Such a position is irreplaceable. Li Na signed with IMG, the most well-known company in tennis representation in September 2009. Since then, not only has her improved her year-end ranking, but also she has impressed the global media with a charismatic new image, for example the AOL describes her as smart, funny and good. Such change probably would not have happened without IMG, who is on top in athlete branding for tennis players. 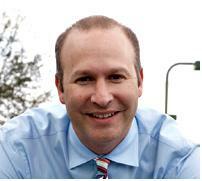 Li Na’s current agent Max Eisenbud is a super tennis agent and Vice President of IMG Tennis. He is also Maria Sharapova’s agent since her career start. Before Li Na, Eisenberg and IMG have shaped Sharapova’s career, making Sharapova the nearly $30 million-a-year woman. And according to Sports Business Journal, it was Eisenbud’s idea that Nike expand its ties with Sharapova to the company’s Cole Haan unit. Eisenbud has also helped Sharapova get into TV and pitched a permanent Sharapova Nike line that other players will one day wear, the way some NBA players today wear the Jordan brand. With such a remarkable track record, it is foreseeable that Eisenbud and IMG will help Li Na release her marketing value to the full. Up to now, Eisenbud has already helped Li Na land sponsorship deals with Rolex ($2.8 million), Haagen-Dazs ($1.2 million), and most recently Mercedes-Benz ($1.5 million annually for three years), and are in discussion with other multiple brands. « The Yao Ming Effect: The end, or a new beginning?